As anyone done any testing with windows 8? I haven't tried it yet but that's because I haven't loaded Windows 8. I should probably try it out since I can get it free through my MSDN subscription. If anyone tries Adventure Maker on Windows 8, please let us know what you think. Tried KeyGuard quickly with Windows 8, seems to work fine at first glance, but I really didn't try it to its full extend. If anything needs to be tested in Win 8, feel free to write. 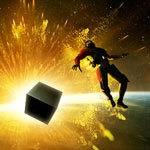 Created ASA: A Space Adventure with win7. Hard drive died during process --> updated to Windows 8. = I completed the development of ASA: A Space Adventure with win8. Everything worked perfectly ! I don't remember if I had troubles because of Win8 but I could always find a solution, and my game is finished and on sale ! Keyguard seems to work too : I tried it even if not used in ASA. So no problem with AM & Win8 for me !